Markus Reymann, Director of TBA21–Academy, moderates a dialogue between Olafur Eliasson and David Gruber, that investigates the properties of light in water and biofluorescence. Light has always played a key-role in Eliasson’s artistic research, from his acclaimed The Weather Project (2003), a site-specific installation in the shape of a large-scale dazzling sun, which debuted at Tate Modern’s Turbine Hall, to Green Light. 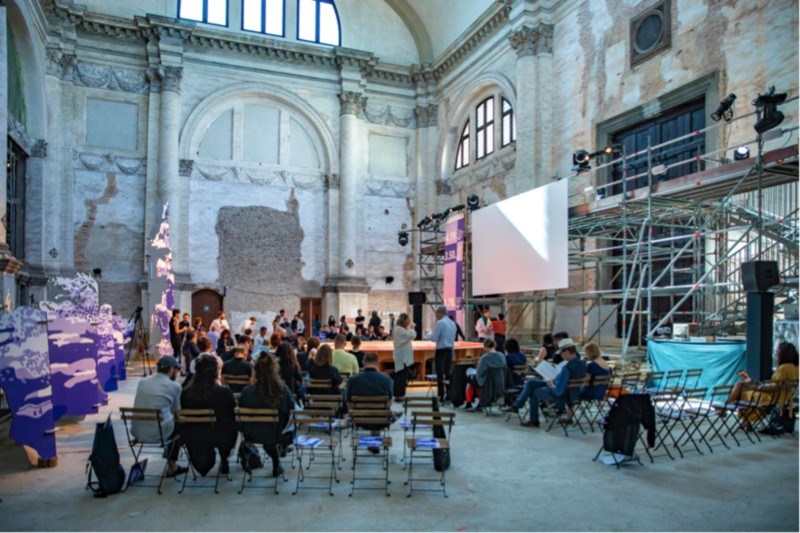 An artistic workshop (2016), conceived in collaboration with Thyssen-Bornemisza Art Contemporary and hosted by the 57th International Art Exhibition of La Biennale di Venezia in 2017. The fluorescent properties of light underwater have been a pivotal interest for ocean explorer and marine biologist David Gruber, who worked closely with artist Joan Jonas for the creation of Moving Off The Land II, the inaugural exhibition at Ocean Space. Eliasson (b.1967) grew up in Iceland and Denmark. In 1995, he founded Studio Olafur Eliasson in Berlin, which today comprises more than one hundred team members, including craftsmen, architects, archivists, researchers, administrators, cooks, programmers, art historians, and specialized technicians. Since the mid-1990s, Eliasson has realised numerous major exhibitions and projects around the world. In 2003, Eliasson represented Denmark at the 50th Venice Biennale, and later that year he installed The weather project at Tate Modern’s Turbine Hall, London. Eliasson’s projects in public space include The New York City Waterfalls, 2008; Fjordenhus, Vejle, 2018; and Ice Watch, 2014, for which Eliasson and geologist Minik Rosing transported massive blocks of glacial ice from Greenland to Copenhagen (2014), Paris (2015), and London (2018) to raise awareness of climate change. In 2012, Eliasson founded the social business Little Sun, and in 2014, he and architect Sebastian Behmann founded Studio Other Spaces, an office for art and architecture. David Gruber is Presidential Professor of Biology and Environmental Science at Baruch College, City University of New York and serves on the faculty of the Ph.D. Program in Biology at the CUNY Graduate Center and the CUNY Macaulay Honors College. He is also an Explorer for National Geographic, a Research Associate in Invertebrate Zoology at the American Museum of Natural History and an Adjunct Faculty member at the John B. Pierce Laboratory of the Yale School of Medicine. His interdisciplinary research pertains to marine biology, genomics/transcriptomics of uncharacterized marine organism, deep-sea ecology, photosynthesis, biofluorescence and bioluminescence. Markus Reymann is the Director and Co-Founder of TBA21–Academy, which fosters interdisciplinary dialogue and exchange surrounding the most urgent ecological, social, and economic issues facing our oceans today. Reymann leads the non-profit’s engagement with artists, activists, scientists, and policy-makers worldwide, resulting in the creation of new commissions, new bodies of knowledge, and new policies advancing the conservation and protection of the oceans. Reymann has been integral developing the vision for Ocean Space and the creation of OceanArchive.